Wat heb je als je geen mensenrechten hebt?! Sluit je aan bij de snel groeiende groep! Waarom is het Volkstribunaal goed voor Nederland! Omdat het zo belangrijk is te weten waar we mee te maken hebben zetten we het verdrag van de rechten van de mens en zijn fundamentele vrijheden hier op onze website. We willen hier laten zien dat deze verklaring de mensenrechten schendt en onder voorwaarden stelt. 1. Een ieder heeft recht op vrijheid van gedachte, geweten en godsdienst; dit recht omvat tevens de vrijheid om van godsdienst of overtuiging te veranderen, alsmede de vrijheid hetzij alleen, hetzij met anderen, zowel in het openbaar als privé zijn godsdienst te belijden of overtuiging tot uitdrukking te brengen in erediensten, in onderricht, in praktische toepassing ervan en in het onderhouden van geboden en voorschriften. 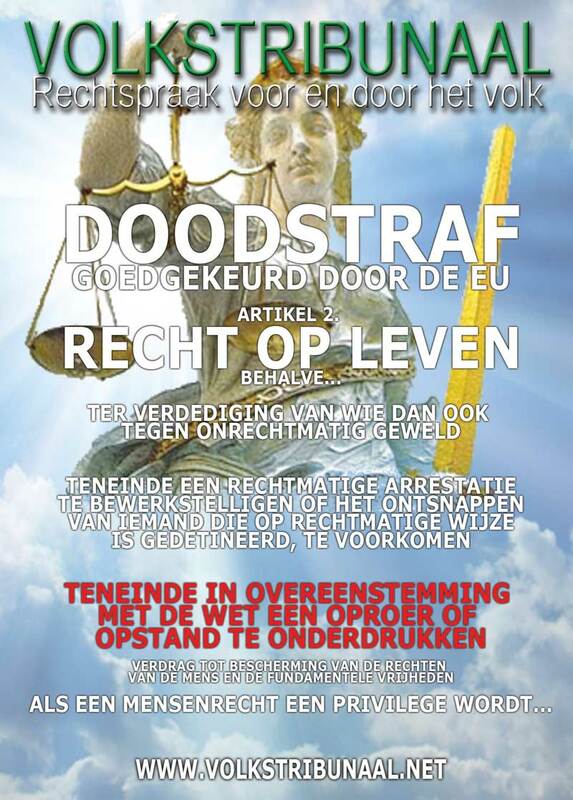 Teneinde de nakoming te verzekeren van de verplichtingen die de Hoge Verdragsluitende Partijen in het Verdrag en de Protocollen daarbij op zich hebben genomen, wordt een Europees Hof voor de Rechten van de Mens ingesteld, hierna te noemen “het Hof”. 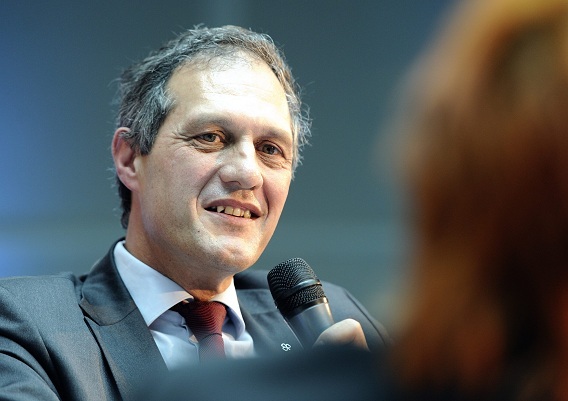 Het functioneert op een permanente basis. 3. 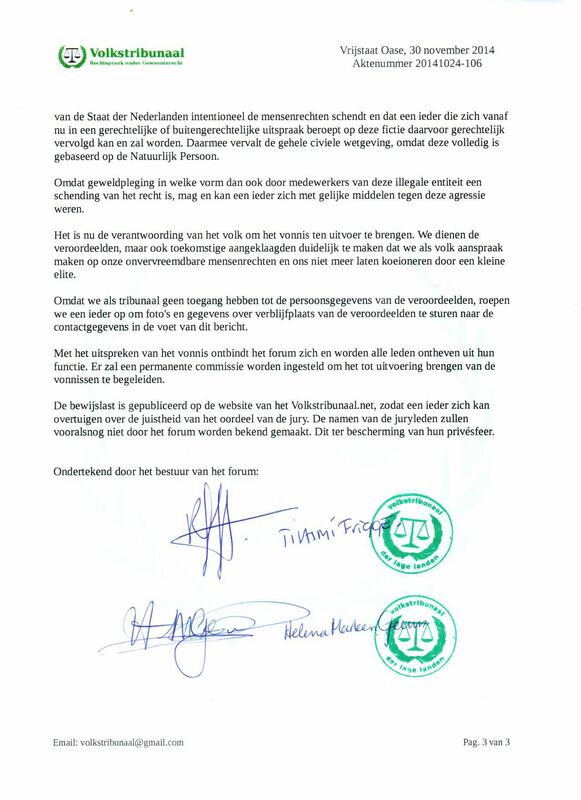 Indien de alleenzittende rechter een verzoekschrift niet niet-ontvankelijk verklaart of niet van de rol schrapt, verwijst deze het door naar een comité of Kamer voor verdere behandeling. 3. Indien het Comité van Ministers van mening is dat het toezicht op de tenuitvoerlegging van een einduitspraak wordt belemmerd vanwege een probleem met de interpretatie van de uitspraak, kan het de zaak voorleggen aan het Hof voor een uitspraak over vragen betreffende de interpretatie. Beslissingen tot verwijzing dienen te worden genomen met een twee derde meerderheid van de vertegenwoordigers die gerechtigd zijn in het Comité zitting te hebben. 4. Indien het Comité van Ministers van mening is dat een Hoge Verdragsluitende Partij weigert zich te houden aan een einduitspraak in een zaak waarbij zij partij is, kan het, na die Partij daarvan formeel in kennis te hebben gesteld en op grond van een beslissing genomen met een meerderheid van twee derden van de vertegenwoordigers die gerechtigd zijn in het Comité zitting te hebben, aan het Hof de vraag voorleggen of die Partij verzuimd heeft te voldoen aan haar verplichtingen uit hoofde van het eerste lid. 1.Everyone’s right to life shall be protected by law. No one shall be deprived of his life intentionally save in the execution of a sentence of a court following his conviction of a crime for which this penalty is provided by law. 2.Everyone who is arrested shall be informed promptly, in a language which he understands, of the reasons for his arrest and of any charge against him. 3.Everyone arrested or detained in accordance with the provisions of paragraph 1 (c) of this Article shall be brought promptly before a judge or other officer authorised by law to exercise judicial power and shall be entitled to trial within a reasonable time or to release pending trial. Release may be conditioned by guarantees to appear for trial. 4.Everyone who is deprived of his liberty by arrest or detention shall be entitled to take proceedings by which the lawfulness of his detention shall be decided speedily by a court and his release ordered if the detention is not lawful. 5.Everyone who has been the victim of arrest or detention in contravention of the provisions of this Article shall have an enforceable right to compensation. 1.No one shall be held guilty of any criminal offence on account of any act or omission which did not constitute a criminal offence under national or international law at the time when it was committed. Nor shall a heavier penalty be imposed than the one that was applicable at the time the criminal offence was committed. 2.This Article shall not prejudice the trial and punishment of any person for any act or omission which, at the time when it was committed, was criminal according to the general principles of law recognised by civilised nations. 1.Everyone has the right to freedom of thought, conscience and religion; this right includes freedom to change his religion or belief and freedom, either alone or in community with others and in public or private, to manifest his religion or belief, in worship, teaching, practice and observance. 2.Freedom to manifest one’s religion or beliefs shall be subject only to such limitations as are prescribed by law and are necessary in a democratic society in the interests of public safety, for the protection of public order, health or morals, or for the protection of the rights and freedoms of others. 1.Everyone has the right to freedom of expression. This right shall include freedom to hold opinions and to receive and impart information and ideas without interference by public authority and regardless of frontiers. This Article shall not prevent States from requiring the licensing of broadcasting, television or cinema enterprises. 2.The exercise of these freedoms, since it carries with it duties and responsibilities, may be subject to such formalities, conditions, restrictions or penalties as are prescribed by law and are necessary in a democratic society, in the interests of national security, territorial integrity or public safety, for the prevention of disorder or crime, for the protection of health or morals, for the protection of the reputation or rights of others, for preventing the disclosure of information received in confidence, or for maintaining the authority and impartiality of the judiciary. 1.Everyone has the right to freedom of peaceful assembly and to freedom of association with others, including the right to form and to join trade unions for the protection of his interests. 2.No restrictions shall be placed on the exercise of these rights other than such as are prescribed by law and are necessary in a democratic society in the interests of national security or public safety, for the prevention of disorder or crime, for the protection of health or morals or for the protection of the rights and freedoms of others. This Article shall not prevent the imposition of lawful restrictions on the exercise of these rights by members of the armed forces, of the police or of the administration of the State. To ensure the observance of the engagements undertaken by the High Contracting Parties in the Convention and the Protocols thereto, there shall be set up a European Court of Human Rights, hereinafter referred to as ‘the Court’. It shall function on a permanent basis. 1.The judges shall be of high moral character and must either possess the qualifications required for appointment to high judicial office or be jurisconsults of recognised competence. 2.The judges shall sit on the Court in their individual capacity. 3.During their term of office the judges shall not engage in any activity which is incompatible with their independence, impartiality or with the demands of a full-time office; all questions arising from the application of this paragraph shall be decided by the Court. 4. There shall sit as an ex offÄ±cio member of the Chamber and the Grand Chamber the judge elected in respect of the High Contracting Party concerned. If there is none or if that judge is unable to sit, a person chosen by the President of the Court from a list submitted in advance by that Party shall sit in the capacity of judge. 2.The Court may decide to restore an application to its list of cases if it considers that the circumstances justify such a course. 1.Hearings shall be public unless the Court in exceptional circumstances decides otherwise. 2.Documents deposited with the Registrar shall be accessible to the public unless the President of the Court decides otherwise. 1.Within a period of three months from the date of the judgment of the Chamber, any party to the case may, in exceptional cases, request that the case be referred to the Grand Chamber. 2.A panel of five judges of the Grand Chamber shall accept the request if the case raises a serious question affecting the interpretation or application of the Convention or the Protocols thereto, or a serious issue of general importance. 3.If the panel accepts the request, the Grand Chamber shall decide the case by means of a judgment. 1.Reasons shall be given for judgments as well as for decisions declaring applications admissible or inadmissible. 2.If a judgment does not represent, in whole or in part, the unanimous opinion of the judges, any judge shall be entitled to deliver a separate opinion. 1.The Court may, at the request of the Committee of Ministers, give advisory opinions on legal questions concerning the interpretation of the Convention and the Protocols thereto. 2.Such opinions shall not deal with any question relating to the content or scope of the rights or freedoms defined in Section I of the Convention and the Protocols thereto, or with any other question which the Court or the Committee of Ministers might have to consider in consequence of any such proceedings as could be instituted in accordance with the Convention. 3.Decisions of the Committee of Ministers to request an advisory opinion of the Court shall require a majority vote of the representatives entitled to sit on the Committee. 1.Reasons shall be given for advisory opinions of the Court. 2.If the advisory opinion does not represent, in whole or in part, the unanimous opinion of the judges, any judge shall be entitled to deliver a separate opinion. 3.Advisory opinions of the Court shall be communicated to the Committee of Ministers. 1. Any State may at the time of its ratification or at any time thereafter declare by notification adressed to the Secretary-General of the Council of Europe that the present Convention shall, subject to paragraph 4 of this Article, extend to all or any of the territories for whose international relations it is responsible. 2. The Convention shall extend to the territory or territories named in the notification as from the thirtieth day after the receipt of this notification by the Secretary-General of the Council of Europe. 4. Any State which has made a declaration in accordance with paragraph 1 of this Article may at any time thereafter declare on behalf of one or more of the territories to which the declaration relates that it accepts the competence of the Court to receive applications from individuals, non-governmental organisations or groups of individuals as provided in Article 34 of the Convention. 1. A High Contracting Party may denounce the present Convention only after the expiry of five years from the date on which it became a Party to it and after six months’ notice contained in a notification adressed to the Secretary-General of the Council of Europe, who shall inform the other High Contracting Parties. 1. This Convention shall be open to the signature of the Members of the Council of Europe. It shall be ratified. Ratifications shall be deposited with the Secretary-General of the Council of Europe. 5. The Secretary-General of the Council of Europe shall notify all the Members of the Council of Europe of the entry into force of the Convention, the names of the High Contracting Parties who have ratified it, and the deposit of all instruments of ratification which may be effected subsequently. Done at Rome this 4th day of November 1950 in English and French, both texts being equally authentic, in a single copy which shall remain deposited in the archives of the Council of Europe. The Secretary-General shall transmit certified copies to each of the signatories. Zoals u kunt lezen worden onze mensenrechten onder voorwaarden gesteld en daarmee zijn het geen mensenrechten meer. Bepalingen beslissen over leven en dood. Het feit dat dit verdrag het ‘Europees Verdrag van de Rechten van de Mens’ wordt genoemd maakt het nog niet tot een weergave van onze rechten. Kijk op Wat zijn mensenrechten om verder te lezen. Weet jij wat je mensenrechten zijn? 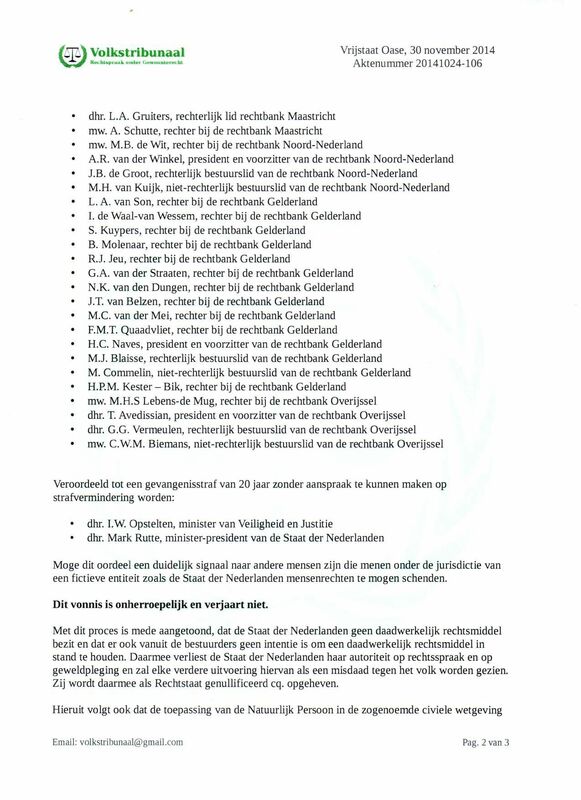 Het Volkstribunaal is er voor iedereen die rechtspraak wil op basis van de mensenrechten de onvervreemdbare rechten van IEDER mens. 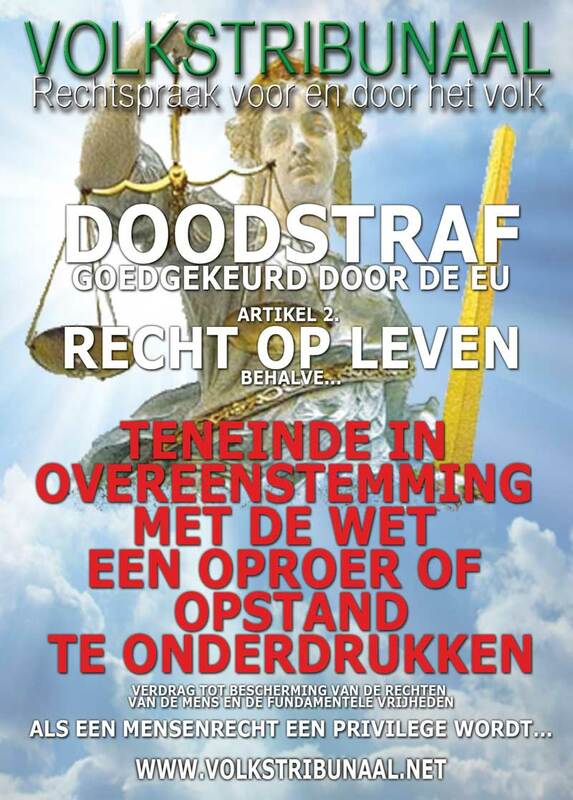 Het is aan ieder mens zelf om een volkstribunaal op te zetten als het huidig rechtssysteem je mensenrechten schendt! 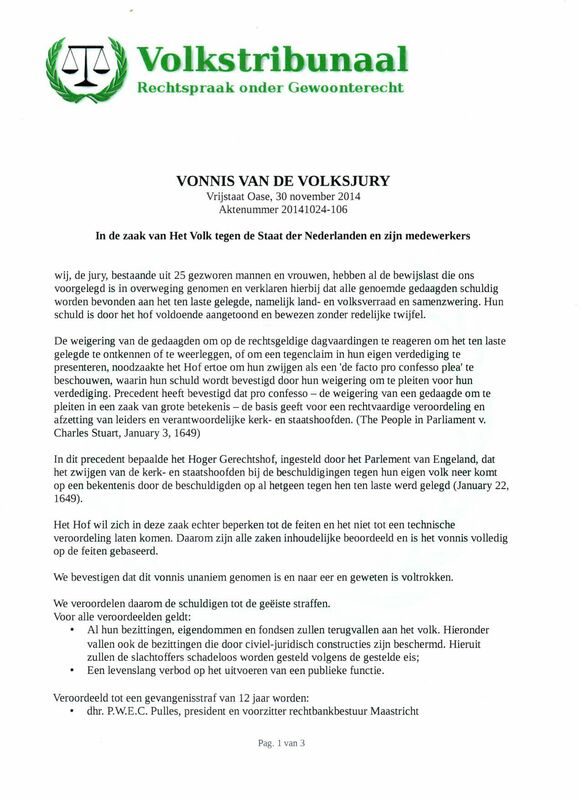 Het Volkstribunaal is een universeel gereedschap voor de toepassing JOUW mensenrechten! 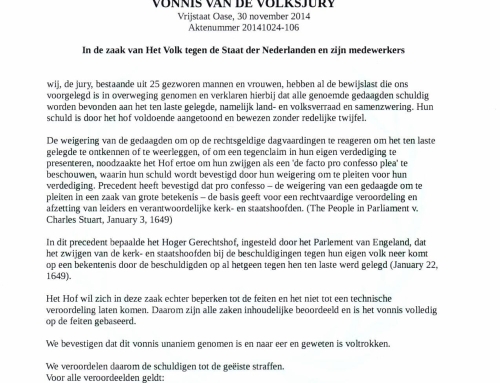 Neem zelf het initiatief en begin je eigen Volkstribunaal.